Our final book signing of the Holiday season occurred at the Barrington Public Library on Sunday, November 17. Lydia and I shared coffee pulled pork and lemonade poppyseed mini-muffins with lemonade glaze with the patrons. Based on all the comments, the fabulous scents were present in every nook and cranny of the building. In case you were not able to come out and still want to grab an autographed copy of the book, you can do so at Brown & Hopkins country store in Chepachet. As always, you can grab a print copy or e-version, which is still on sale! It's likely to be our final in-person book signing of the season, so we hope to see you on Sunday, November 17, at the Barrington Public Library, from 2:00 until 3:30 p.m..
We'll have a small supply of books with us, and you also can purchase your books ahead of time on Amazon.com and bring them with you to sign. Jennifer and I will be making a couple of recipes from the book -- it's just possible that little muffins will be involved -- so please come and say hello, nibble on some Rhode Island deliciousness, and we'll be delighted to sign books for your holiday gifts (or for yourself!). Sunday, November 17, 2:00 p.m. Thanks to golocalprov.com for featuring a dozen of our favorite Fall recipes today! Come to the Johnny Cake Festival at Kenyon's Grist Mill this weekend, or see us at Dave's Marketplace in East Greenwich on Friday, October 25, where we'll be sharing recipes and signing books. There might be some treats, too. 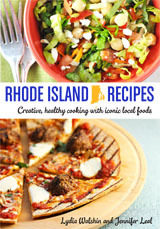 Remember: the e-book version of RHODE ISLAND RECIPES is on sale this week for $4.99! Click the link in the left-hand column here, to order.